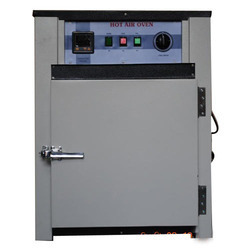 Providing you the best range of hot air ovens, industrial ovens and heating ovens with effective & timely delivery. 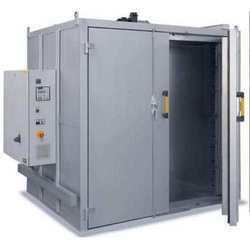 Hot Air Ovens / forced air ovens are engineered to meet your most demanding needs and solutions to specific applications such as drying, curing, baking, and sterilizing while also allowing for considerations of performance and price. Matrusree’s Large Capacity Ovens were designed to meet the demand for large capacity, multi-purpose ovens. Matrusree’s unique turbo blower system creates a true one-pass circulation pattern that provides both exceptional temperature uniformity and rapid heat recovery. A slide-operated vent allows the user to adjust fresh air ventilation. This permits adjustment from continuous fresh air intake to closed recirculation. Offers a high level of performance and optimal circulation with the oven shelves fully loaded. Heated air is directed into the duct space on the right side of the oven and flows through horizontal slots and across the shelves. The air then exits the chamber through slots on the opposite chamber wall. "One pass" circulation means that the air is circulated through the blower and over the heating elements each time it passes through the oven chamber. Safety Designed into Ovens. Each oven is equipped with an independent safety digital temperature controlling System. Two floor model ovens are offered to maximize laboratory space and allow high performance, large volume drying capabilities. The matrusree Industrial Ovens has been designed and engineered using the latest computer aided design systems to facilitate production of all metal components on the latest CNC controlled production equipment. Both gravity convection and forced air circulation models are included in the matrusree series. The bench mounted models are available in four sizes with a maximum operating temperature of 300°C. Incubators have a maximum temperature of 80°C. The ovens are constructed for long term reliability. Depending on the choice of control system, they can perform simple drying processes or more complex and demanding heat treatment processes and long term stability testing of materials or components. Low cost Fully equipped, all purpose laboratory ovens for fully equipped, all purpose laboratory ovens for sample drying, baking, annealing, conditioning, sterilizing, evaporating and dehydrating, and other general laboratory work. Economical Bench ovens easily moved to various locations. For processing large parts, baking, drying components after cleaning, dehydration, preheating, curing and other applications requiring circulation of heated air. 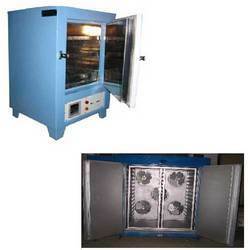 Heating Ovens offered provides for stable test space for pre-heating, drying and other testing.